In January 2015 the Scottish Government introduced universal free school meals for all children in primary 1-3. This replaced the targeted system, where children whose family received certain benefits could receive a free school meal. This targeted system continues for children in primary 4 and above. 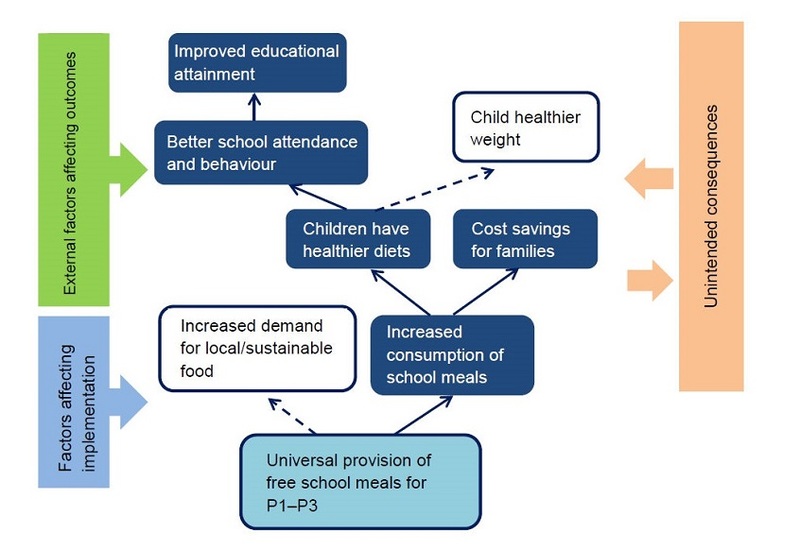 NHS Health Scotland is interested in understanding what works to reduce health inequalities and the impact the universal free school meal policy might have. We’re leading the evaluation alongside colleagues from the MRC Social and Public Health Sciences Unit and Scottish Collaboration for Public Health Research & Policy (SCPHRP). An evaluability assessment shaped the focus of the current evaluation. We’re taking a theory based approach to this evaluation which aims to test the theory of change developed for this policy. The theory of change below describes how the policy might lead to key changes in the population. The evaluation has 3 strands. Monitoring changes in the uptake of free school meals (latest report October 2016). Asking parents about their views and experience of the policy (latest report October 2015). Speaking to schools and local authorities about their experience of the policy (latest report March 2016).